As you probably know by now, vehicle safety is our number one priority at Honda. We strive to keep the driver and passengers not only as comfortable as possible, but in the event of a sudden crash or accident, as safe as possible as well. Honda is constantly improving its safety features in its vehicles, and the 2016 Honda Pilot is no exception. In a recent round of testing by the Institute for Highway Safety (IIHS), the 2016 Honda Pilot was given the top honour possible with a “Top Safety Pick+” rating. The 2016 Pilot passed all of its crash test with at least “good” ratings, including the tricky “small overlap test”, which is a frontal crash test that measures space in the driver’s seat after a crash. Previously, the Honda Pilot had not performed as well as it had hoped, but with some adjustments and improvements (as you’ll see in the video below), it passed the test this year with flying colours. 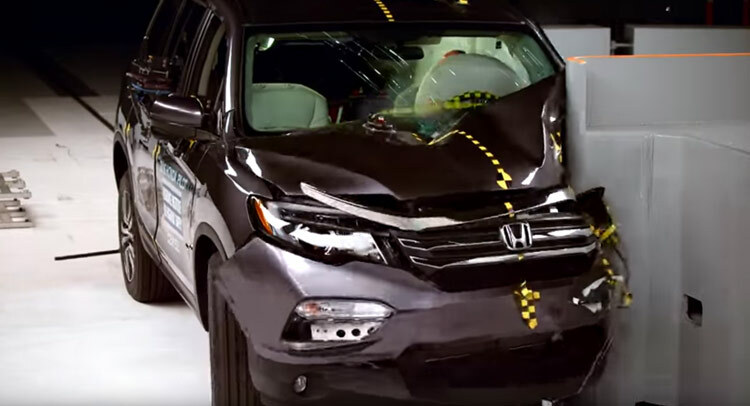 The 2016 Honda Pilot suffered surprisingly little deformation and structural damage after the test, as the video shows. The 2016 Honda Pilot is quickly becoming a favourite of auto enthusiasts and Canadian drivers alike, and it’s no surprise to us when you see how safe this vehicle really is. You can find a detailed report on the safety of the Honda Pilot from the IIHS here. Come visit us at Henley Honda and take a 2016 Honda Pilot out for a spin. Although, we can’t guarantee you won’t want to take it home with you after!